Charming & Warm to your holiday decor. Made of metal, cotton, fabric tinsel, natural rattan, glitter and electrical components. Extra bulbs and fuse included 50 lights. 60″ white lead cord. Suitable for indoor/outdoor use. KD packing with assembly instruction. Easy assembly. Lawn stakes included. Size approx: 33.5âL x 11.5âW x 48âH. 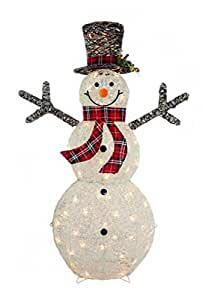 This snowman is accented with sparkling glitter and wrapped with soft cotton, giving a snow covered effect. It will light up the holiday with a beautiful glow. Perfect for yard art, shopping malls, hotels, office buildings, or anywhere that commands attention. Fully dimensional design and Ground stakes included. Easy assembly, collapsible construction for easy storage. UL listed for indoor or outdoor used. Meizhou Hongfeng Arts And Crafts Co.,Ltd.